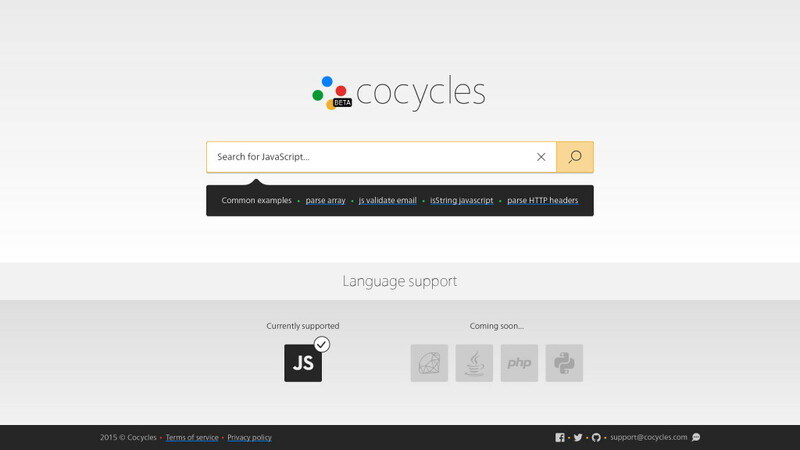 Cocycles is a new code search service that enables code to be found by functionality. In this article, Cocycles team member Jonathan explains the idea behind this approach to code searching. We’re all familiar with it: that moment when you’re forced to abandon your code editor, interrupt your workflow and open your browser to search for a code snippet or explanation of how to code something. It can be a time consuming and frustrating process. Google and Bing can understand English pretty well, but they can’t read code. Sometimes luck’s on our side, and sometimes it’s not. However, it doesnâ€™t have to be like this. In April 2016, GitHub reported that it holds over 35 million repositories. Thatâ€™s a whole lot of code lines! I’m willing to bet that most of what developers search for every single day already lies somewhere around the open-source web. Up till now, the problem has been that we can’t easily find it. This is why we built Cocycles, a search engine for code. In this article, I’ll introduce this new tool, explaining how it works and how to use it. match the two, sit tight and wait for the â€œThank youâ€� flowers. In reality, this is an ongoing process, in which community cooperation is a major key. 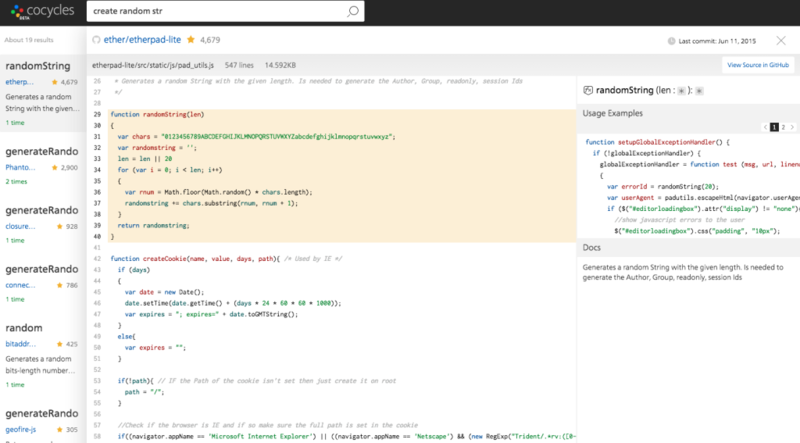 Cocycles is a technology that learns to understand what each piece of code does. It looks not only at the codeâ€™s signature, text or documentation, but also — and primarily — at its functionality. Cocycles understands code and what it does. It’s actually able to tell which pieces of code are best for swapping two elements in a given array, or creating a random string, and is able to identify them and even understand the connections between different pieces. Cocycles is able to understand English. It’s also designed to understand developers. To achieve this, Cocycles uses natural language processing algorithms to understand the description of the code you need and find what you’re looking for. So when searching via Cocycles, it’s best to describe what you need in the same way you’d search for it in a search engine like Google, Bing and others. Unlike these, however, Cocycles is able to understand code, and therefore will translate your query into the desired code functionality. For example, if you need to swap two elements in a given array, you should simply search for â€œswap elementsâ€�. If you need to parse the headers of an HTTP request, search for â€œparse http headersâ€�. And when looking for a function to create a random string, try searching for â€œcreate random strâ€�. Thanks to semantic capabilities, Cocycles is also able to understand that â€œStringâ€� is the same as â€œStrâ€� and â€œCreateâ€� might mean â€œGenerateâ€�. Furthermore, you can try looking for something broader, such as â€œtimerâ€�, and find useful timer classes with different methods. When opening a result unit, Cocycles takes you in to an IDE-like interactive exploration mode. It allows you not only to view the full source implementation itself, but also interact with the code. Hovering over certain parts will highlight matching parts; clicking on a certain variable or function will move you to its definition; and soon it will be possible to jump between files and even entire projects. 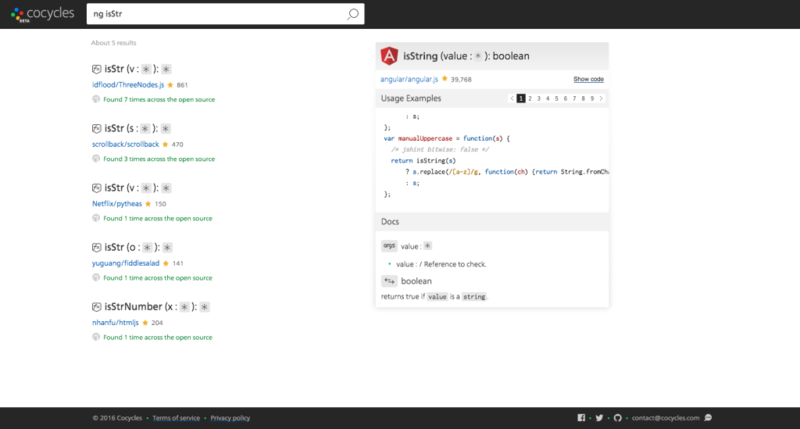 This takes Cocycles out of the world of â€œsnippetsâ€� and into the world of learning, exploring and making code useful. This last view will adapt to fit various types of results. For example, if the selected result is a class, Cocycles will list its methods and will offer a quick browse between them. When available, Cocycles will also provide the full original documentation for every code unit found. Even cooler, it will find real usage examples from which you can learn how to use the code you find and how other people did so. If needed, you can also view the codeâ€™s source in GitHub directly. Cocycles isnâ€™t perfect. The technological challenges are massive. It’s a process, and an ongoing endeavor to organize all the code in the world and make it accessible. It’s being built with help from the community, and by advice from some of the web community’s leading lights. It’s free, and built to last. We also understand that the future lies in providing even more value to people — by harnessing more of the potential hidden in the open-source world. For example, we should be able to identify in real time when a developer is making a mistake, or is writing less than optimal code. We need to be able to offer an instant solution based on open-source code. We’re currently working on something that will offer all of this and more. We have a newsletter you can subscribe to, and a Twitter feed, if you want to be notified of updates. Itâ€™s yours to use, and any kind of feedback, ideas or thoughts would be gratefully welcomed. Visit cocycles.com and tell us what you think! Jonathan S. (Joni Sar) is a part of the Bit team and has spent a lot of time and effort designing Bit and the free and open Bit community. He loves to talk about OSS and designing things from the grounds-up. Feel free to get in touch.